The narrow lanes of Bungamati were lit with small clay lamps, leading the way from the entrance to the town to the evening’s festivities. The locals had kept their small gift shops and woodcraft workshops open beyond dusk to cater to the inpouring of visitors. Before even making it to Bungamati’s Amarapur Square, the sense of occasion and celebration was palpable. My first thought as I entered the square, with its floodlit stage constructed above neatly stacked bricks and a gaping hole where Bungamati’s famous temples once stood, was that the little town wouldn’t have known what hit it. 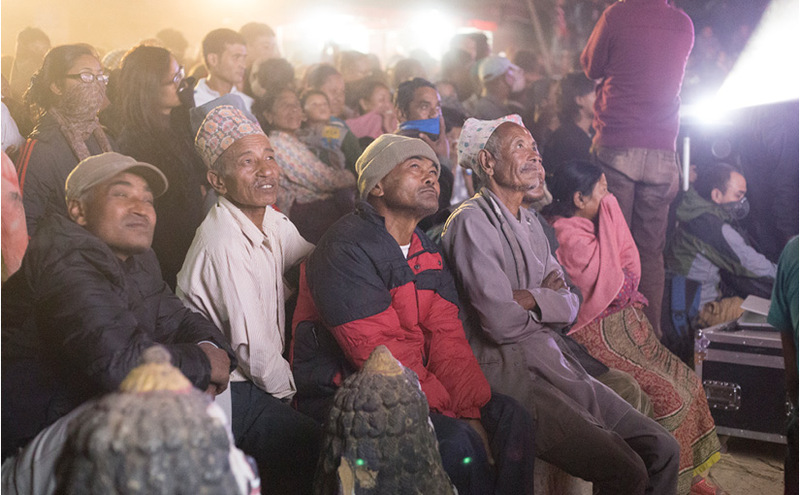 Hundreds were gathered to watch folk-rock band Kutumba, to see the exhibit of photographs documenting Bungamati’s history, and to attend the fundraising bhoe—or traditional Newari feast. But then I remembered that Bungamati is the home of Rato Macchendranath, the patron god of Patan, and plays a central role in the pre-monsoon Rato Macchendranath festival. Of course the town had seen these types of crowds before. And then some. The Rato Macchendranath festival is believed to be the largest in Nepal. The Newar town, 12 kilometres south of central Kathmandu, dates from around the 7th century. But, like other old settlements in the Kathmandu Valley built largely of brick, it fared badly in the 2015 earthquake. The large white shikara of the Bungadya Temple and the copper pagoda of the Hayagriva Bhairab Temple were once the centrepiece of one of Kathmandu’s prettiest little towns, but they are no more. Almost nothing remains in the central square now, except for that gaping hole and rubble that seems to be stacked neater than in other parts of Kathmandu. Efforts are underway to rebuild Bungamati’s cultural treasures. On 25th October, a fundraiser was held for the Bungamati Cultural Museum. At the moment, the museum is a small collection of rather dusty objects reflecting the history and culture of this little town. 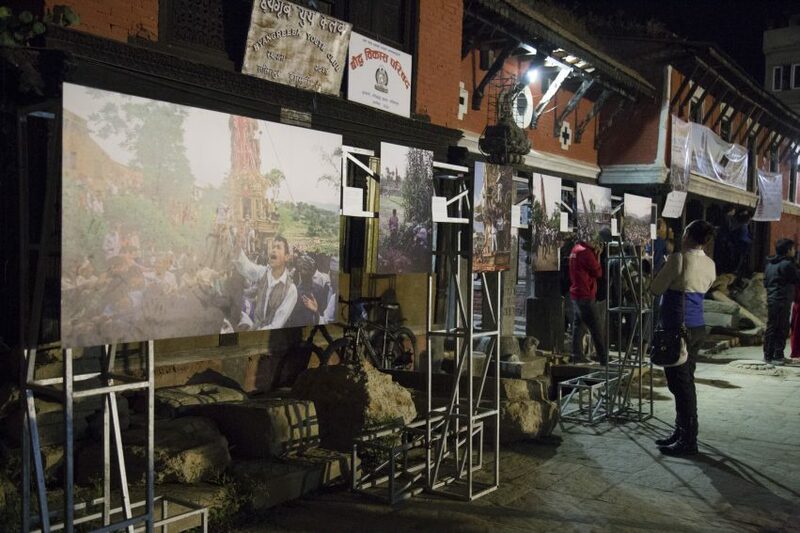 The second annual Photo Kathmandu Festival collaborated with the museum to showcase the visual history of Bungamati. The result was an impressive evening of music, photography, good food and people from all backgrounds joining the celebration and commemoration. 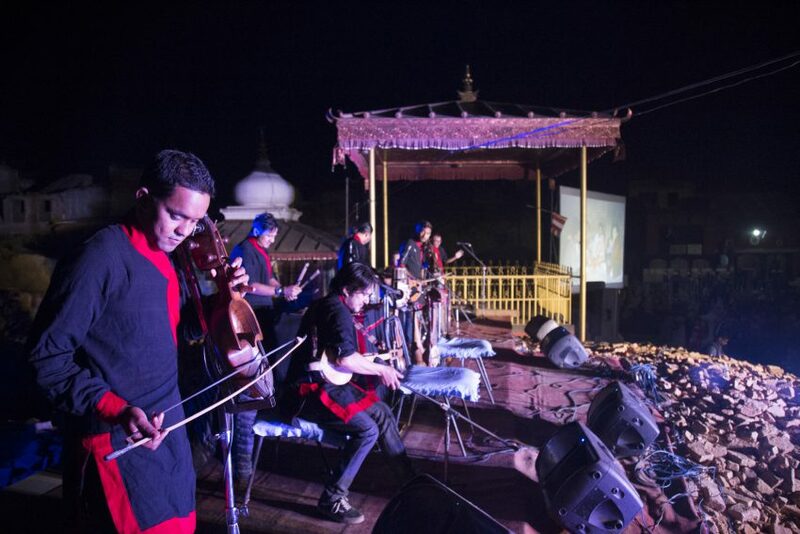 Preceding the Newari feast was an open-air concert by Kutumba, a folk band who only use traditional Nepali instruments. Despite the traditional sounds, the atmosphere they generated was as energetic as any rock concert. Their name represents a unique bond among community members, and was reflected in the excitement and sense of celebration that they generated in everyone gathered in Bungamati. Around the edge of the square, the photography exhibit ‘Bungayā: Rāto Matsyendranāth: Forty Years of Festival’ by Bruce McCoy Owens was displayed. The photographer has been photographing the Rato Macchendranath festival for around forty years, and has taken thousands of pictures of it. 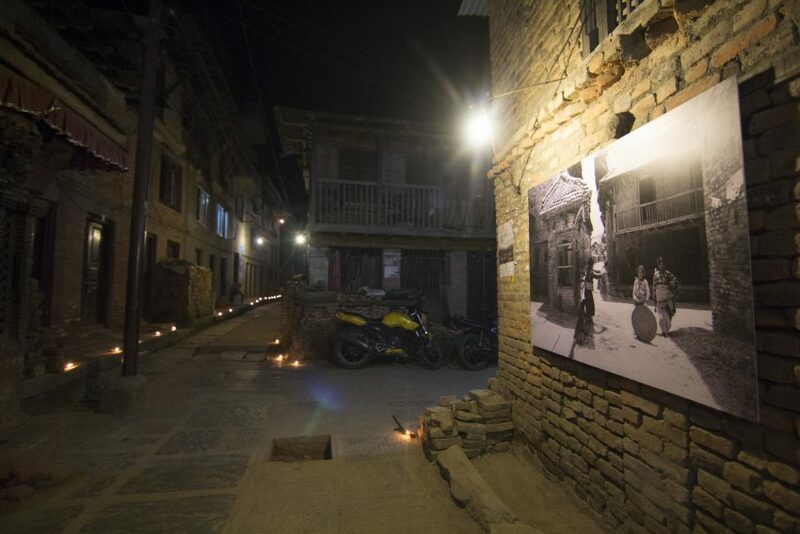 (It’s a two-part exhibition, and the other half is located in Patan, where the Rato Macchendranath festival procession begins). The photos document a Bungamati, and a Kathmandu, of an earlier time. Although not so many decades have passed, the changes in the physical landscape are dramatic. Several photos from 1991 show how much building has occurred in the valley in the past couple of decades. But most impressive were the photos of the (dangerously listing) Rato Macchindranath chariot, as astonishing in photographs as it is to witness in real life. The evening was extremely well run, and most impressive of all, seemed to be very inclusive of every section of society. Children ran and played in the square, and danced to the music. Old women in traditional outfits inspected the photographs documenting the history of their town, no doubt being reminded of how things used to be. Foreigners and locals sat knee-to-knee on straw mats to enjoy the Newari meal together. The group of young men sitting beside me had been given free tickets by their workplace, a local brick factory, and were excited to practice their English with me. Any art exhibition, in Kathmandu or elsewhere, has the potential to be irrelevant to many ordinary people, but this was not so at the Photo Kathmandu event in Bungamati. If the energy and innovation on display in Bungamati on this special evening are any indication, the town has reason to be hopeful about its future.